I am pleased to announce that I am working with London-based curator Chris Craig to organise the upcoming solo exhibition of works by David Breuer-Weil, entitled Project 4, which will open to the public from 7th of February until 1st of March inclusive. One of the largest exhibitions of Breuer-Weil’s work to date, Project 4 will bring together over 70 paintings and sculptures within the cavernous Victorian railway arches of Leake Street, near Waterloo station. I can be contacted on p4admin@breuer-weil.com with any enquiries. In November I installed the second in a two-part exhibition of the work of German artist Lothar Götz (the first part can be seen here). This section of the project included important objects and works of art that have all influenced Götz’s practice, be they in formal or intellectual ways, through familial relationships and the ties of friendship, shared affinities, or the beauty of production. 14 objects were included within the large gallery space, consisting of works on paper, sculpture, painting and fine porcelain, which were all hung or juxtaposed with the five large gouache on ply works that Götz made for the first installment of the exhibition. Importantly in this respect, the show displaced the focus from Götz’s own work to that of those individuals or manufactories he strongly reveres. 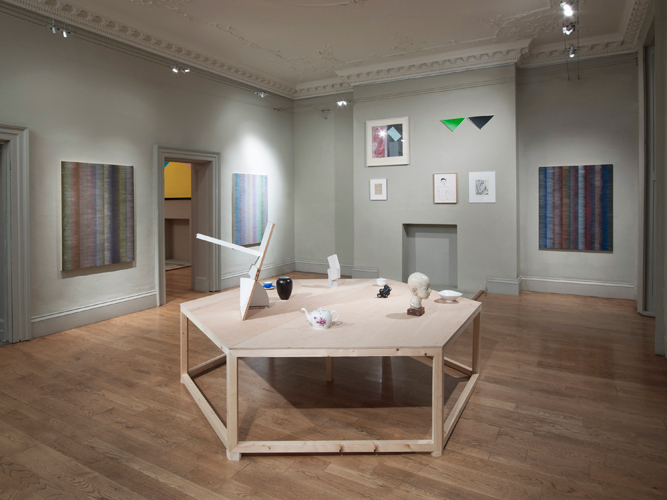 A series of drawings made in response to each object and hung directly on top of the small gallery’s site-specific painted mural, manifested the artist’s own working practice as being directly linked to each of his ‘guests’, at a point somewhere between subliminal influence and overt recognition. The drawings veer between psychographical automatism and strictly controlled inquiries into form and colour, and all are executed within the strictly defined boundaries of a single size of paper. 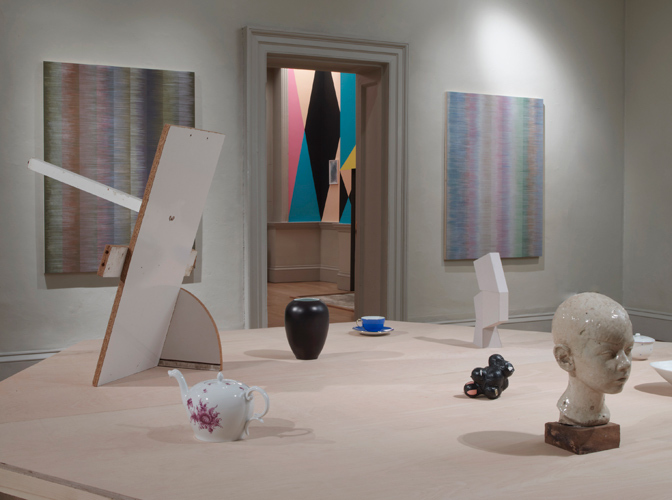 Where some seek to explode form forcibly, prostrating it onto a flat surface and contorting it into a new illusionism akin to Duchamp’s Rotoreliefs of 1923, others delight in the innately two-dimensional nature of the original, such as ‘Retreats (Ben Nicholson)’, and ‘Retreats (Ernst Wilhelm Nay)’, in which Götz reapplies colour to imagery already flattened and abstracted by the compositions of the artists referenced in the titles. 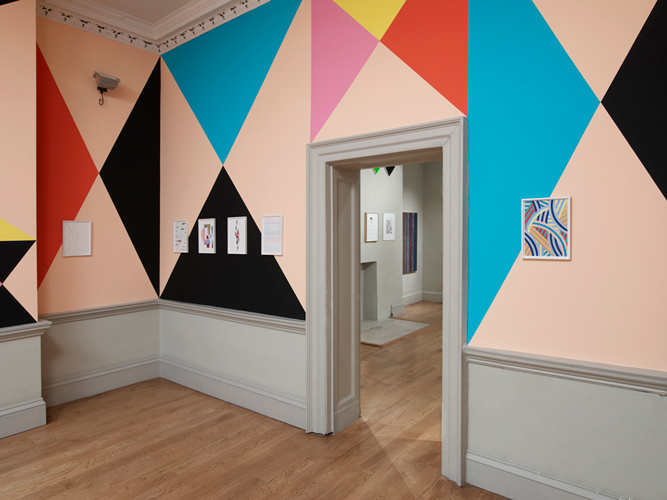 ‘The Line of Beauty + Special Guests’ included works by Eric Bainbridge, Neil Gall, Joachim Grommek, Daniel Robert Hunziker, Paul Huxley, Ernst Wilhelm Nay, Ben Nicholson, Uli Nimptsch and George Shaw.